IT has been my good fortune and my joy to know a man who truly "walked with God," a noble being, a saint, a philosopher, and a true friend. His influence upon my spiritual life was profound. He opened up new horizons before me, enlarging and vivifying my religious ideas and ideals, teach­ing me a broader understanding of truth. My soul will bear him an eternal gratitude. This extraordinary man was a Hindu monk of the order of the Vedantas. He was called the Swami Vivi Kananda, and was widely known in America for his religious teachings. He was lecturing in Chicago one year when I was there; and as I was at that time greatly depressed in mind and body, I decided to go to him, having seen how greatly he had helped some of my friends. An appointment was arranged for me, and when I arrived at his house I was immediately ushered into his study. Before going, I had been told not to speak until he addressed me. When I entered the room, therefore, I stood before him in silence for a moment. He was seated in a noble attitude of meditation, his robe of saffron yellow falling in straight lines to the floor, his head, swathed in a turban, bent forward, his eyes on the ground. After a brief pause, he spoke without looking up. "My child," he said, "what a troubled atmosphere you have about you! Be calm! It is essential!" Then in a quiet voice, untroubled and aloof, this man, who did not even know my name, talked to me of my secret problems and anxieties. He spoke of things that I thought were unknown even to my nearest friends. It seemed miraculous, super­natural! He looked at me with his quiet smile, as though I were a child who had asked a foolish question. "You must forget—" he said, as I rose. "Become gay and happy again. Build up your health. Do not dwell in silence upon your sorrows. Trans­mute your emotions into some form of external ex­pression. Your spiritual health requires it. Your art demands it!" I left him, deeply impressed by his words and his personality. He seemed to have emptied my brain of all its feverish complexities, and placed there in­stead his clear and calming thoughts. I became once again vivacious and cheerful, thanks to the eflFect of his powerful will. He did not use any of the ordinary hypnotic or mesmeric influences. It was the strength of his character, the purity and intensity of his purpose, that carried conviction. It seemed to me, when I came to know him better, that he lulled one's chaotic thoughts into a state of peaceful quiescence, so that one could give complete and undivided attention to his words. He often spoke in parables, answering our ques­tions or making his point clear by means of a poetic analogy. One day we were discussing im­mortality and the survival of individual character­istics. He was expounding his belief in reincarna­tion, which was a fundamental part of his teaching. "I cannot bear the ideal" I exclaimed. "I cling to my individuality, unimportant as it may be I I don't want to be absorbed into an Eternal Unityl The mere thought is terrible to me I"
"One day a drop of water fell into the vast ocean," the Swami answered. "When it found it­self there, it began to weep and complain, just as you are doing. The great ocean laughed at the drop of water. 'Why do you weep?' it asked. 'I do not understand. When you join me, you join all your brothers and sisters, the other drops of water of which I am made. You become the ocean itself I If you wish to leave me, you have only to rise up on a sunbeam into the clouds. From there you can descend again, little drop of water, a blessing and a benediction to the thirsty earth.' "
With the Swami and some of his friends and fol­lowers, I went upon a most remarkable trip, through Turkey, Egypt and Greece. Our party included the Swami, Father Hyacinthe Loyson, his wife, a Bostonian, Miss McL. of Chicago, ardent Swamist and charming, enthusiastic woman, and myself, the song bird of the troupe. What a pilgrimage it was! Science, philosophy and history had no secrets from the Swami. I listened with all my ears to the wise and learned dis­course that went on around me. I did not attempt to join in their arguments, but I sang on all occa­sions, as is my custom. The Swami would discuss all sorts of questions with Father Loyson, who was a scholar and a theologian of repute. It was interesting to see that the Swami was able to give the exact text of a document, the date of a church coun­cil, when Father Loyson himself was not certain. "Where did you acquire all this information?" we asked him one day. When we were in Greece, we visited Eleusis. He explained its mysteries to us, and led us from altar to altar, from temple to temple, describing the processions that were held in each place, inton­ing the ancient prayers, showing us the priestly rites. The Swami was always absorbingly interesting, even under ordinary conditions. He fascinated his hearers with his magic tongue. Again and again, we would miss our train, sitting calmly in a station waiting room, enthralled by his discourse and quite oblivious to the lapse of time. Even Miss McL., the most sensible among us, would forget the hour, and we would in consequence find ourselves stranded far from our destination, at the most inconvenient times and places! One day we lost our way in Cairo. I suppose we had been talking too intently. At any rate, we found ourselves in a squalid, ill-smelling street, where half-clad women lolled from windows and sprawled on doorsteps. He began to weep, as Jesus might have done be­fore the woman taken in adultery. The women were silenced and abashed. One of them leaned forward and kissed the hem of his robe, murmuring brokenly in Spanish, "Hombre de dios, hombre de diosr (Man of God!) The other, with a sudden gesture of modesty and fear, threw her arm in front of her face, as though she would screen her shrinking soul from those pure eyes. This marvellous journey proved to be almost the last occasion on which I was to see the Swami. Shortly afterward he announced that he was to return to his own country. He felt that his end was approaching, and he wished to go back to the community of which he was director and where he had spent his youth. A year later we heard that he had died, after writing the book of his life, not one page of which was destroyed. He passed away in the state called Samadhi, which means, in Sanscrit, to die voluntarily, from a "will to die," without accident or sickness, saying to his disciples, "I will die on such a day." "He has passed on," he answered. The Vedantas believe that they have preserved, in its original purity and simplicity, the teachings of Buddha. They have no temples, saying their prayers in a simple oratory, with no symbolic fig­ures or pictures to stimulate their piety. In one corner of this place is a small statue of Buddha, as though they wished to say, "It is from him that we have learned the way." Their prayers are all ad­dressed to the Unknown God. "Oh Thou who hast no name! O Thou whom none dare name! O Thou the Great Unknown!" they say in their supplications. The Swami taught me a sort of respiratory prayer. He used to say that the forces of the deity, being spread everywhere throughout the ether, could be received into the body through the in­drawn breath. The monks of the Swami's brotherhood received us with simple, kindly hospitality. They offered us flowers and fruits, spreading a table for us on the lawn beneath a t welcome shade. At our feet the mighty Ganges flowed. Musicians played to us on strange instruments, weird, plaintive chants that touched the very heart. A poet improvised a mel­ancholy recitative in praise of the departed Swami. The afternoon passed in a peaceful, contemplative calm. The hours that I spent with these gentle philosophers have remained in my memory as a time apart. These beings, pure, beautiful and remote, seemed to belong to another universe, a better and wiser world. 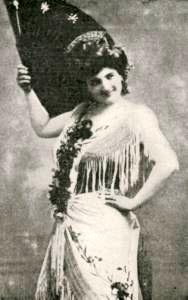 Madame Emma Calve, the opera singer, who later became his devotee, related the incident, which may have taken place in the early part of 1894, to her friend, Mme Paul Verdier, herself a devotee of Vivekananda. 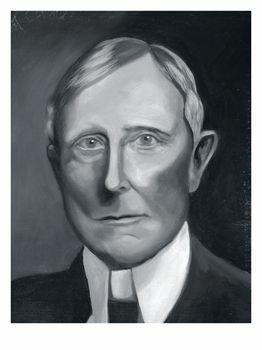 Mr. X, in whose home Swamiji was staying in Chicago , was a partner or an associate in some business with John D. Rockefeller. Many times John D. heard his friends talking about this extraordinary and wonderful Hindu monk who was staying with them, and many times he had been invited to meet Swamiji, but, for one reason or another, always refused. At that time Rockefeller was not yet at the peak of his fortune, but was already powerful and strong-willed, very difficult to handle and a hard man to advise. But one day, although he did not want to meet Swamiji, he was pushed to it by an impulse and went directly to the house of his friend, brushing aside the butler who opened the door and saying that he wanted to see the Hindu monk. The butler ushered him into the living room, and, not waiting to be announced, Rockefeller entered into Swami's adjoining study and was much surprised, I presume, to see Swamiji behind his writing table not even lifting his eyes to see who had entered. After a while, as with Calve, Swamiji told Rockefeller much of his past that was not known to any but himself, and made him understand that the money he had already accumulated was not his, that he was only a channel and that his duty was to do good to the world-that God had given him all his wealth in order that he might have an opportunity to help and do good to people. "Well, there you are," he said. "You must be satisfied now, and you can thank me for it." Swamiji didn't even lift his eyes, did not move. Then taking the paper, he quietly read it, saying: "It is for you to thank me." That was all. 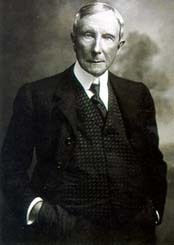 This was Rockefeller's first large donation to the public welfare.